Beijing / Les Moulins / Habana. Photo by: Alicia Luxem. Bloomfield Hills, Michigan, January 28, 2018—In the summer of 2019, Cranbrook Art Museum will present Landlord Colors: On Art, Economy, and Materiality, a landmark exhibition showcasing works from five international contemporary art scenes that were born out of post-economic, societal upheaval in their respective 20th and 21st century environments. Curated by Laura Mott, Senior Curator of Contemporary Art and Design at Cranbrook Art Museum, the exhibition will explore how artistic innovation and materiality communicate socio-economic context and paradigmatic shifts, while unearthing a prevailing, cross-cultural narrative. Ranging from seminal historic work to new, site-specific commissions in the museum and throughout the city, Landlord Colors will explore complex and unexpected relationships between the project’s featured artists, highlighting shared themes of ingenuity, resourcefulness, and resistance. The exhibition will be on view at Cranbrook Art Museum in Bloomfield Hills, Michigan, from June 21 through October 6, 2019. And contemporary Greece, following the financial crisis of 2008. The exhibition will be accompanied by a publication, as well as a robust public engagement series featuring site-specific art and performances throughout Metro Detroit. Featured artists include: Andreas Angelidakis, Belkis Ayón, Kevin Beasley, Tania Bruguera, James Lee Byars, Brenda Goodman, Ha Chong-Hyun, Matthew Angelo Harrison, Scott Hocking, Jannis Kounellis, Mario Merz, Marisa Merz, Reynier Leyva Novo, Zoë Paul, Michelangelo Pistoletto, Wilfredo Prieto, Lee Ufan, and Kwon YoungWoo, among others. The exhibition’s title, “Landlord Colors,” references a term coined by painter John Baldessari to describe the undesirable tones associated with off-brands and poor taste. The moniker was partly inspired by the palette Baldessari used to paint his father’s rental properties, which, due to economic circumstance, became a dominant backdrop to the lives of tenants. The phrase poetically speaks to the panoramic condition of Detroit as an emblem of failed American capitalism—a situation not of its own choosing— and to the exhibition’s organizing theme of art and economy more broadly. The exhibition will spotlight Detroit alongside four additional art scenes—focused primarily in the cities of Turin, Seoul, Havana, and Athens—that responded to precarious circumstances with an upsurge in creative output. Artists living in downtown Detroit during the 1960s and 1970s drew on the antiaesthetic of broken, raw materials sourced from the city, which visually captured both the resilience and violence inherent in the urban landscape. Works in Landlord Colors will address this local history while considering it in relation to contemporary artistic production in Detroit. For example, a new commission by Detroit-based artist Scott Hocking will draw its inspiration from an infamous 19th -century photograph featuring a mounting pile of buffalo skulls, which were shipped to Detroit from the West and used to create industrial materials, including a paint pigment that is still produced in the city today. Hocking will respond to this historic photograph and create a site-specific work of a similar scale, marking one of the most ambitious works in the show. Similarly, artists associated with the Arte Povera movement in Italy often turned to natural, industrial, and found materials in reaction to the country’s rapid industrialization during two decades of social turbulence known as the ‘Years of Lead.’ A sculptural piece by Italian artist Mario Mertz, Igloo (1971), will reflect this trend, combining steel tubes, neon, wire mesh, and C-clamps into a hemispherical structure that embodies two essential human needs—habitation and communication. 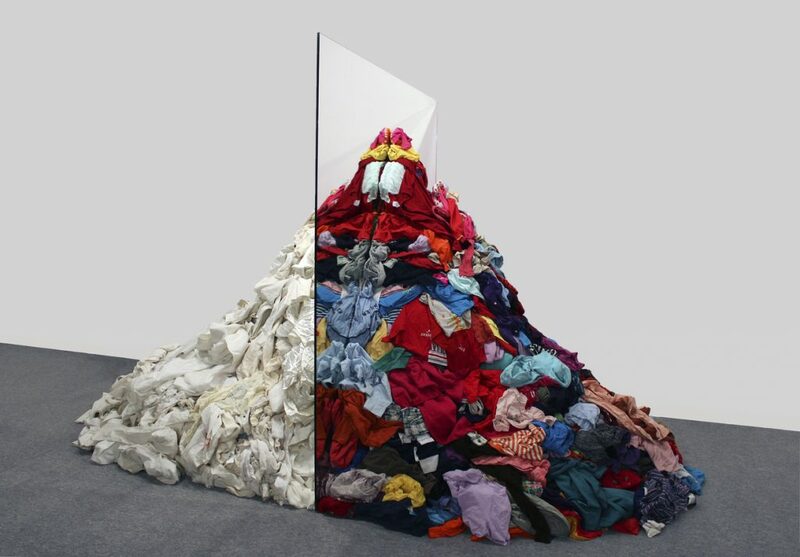 Landlord Colors will also feature works by leading Arte Povera figure Michelangelo Pistoletto, including a site-specific version of the artist’s 1976 sculptural installation ‘Metamorfosi,’ and an interpretation of his globally famous work, ‘The Third Paradise’. Detroit native Matthew Angelo Harrison will create a new work for Landlord Colors in response to the Arte Povera movement, further contributing to the exhibition’s layered narrative. Formerly a clay model maker for the Ford automotive company, Harrison’s sculptural interests include the creation of mechanical apparatuses that allow him to reproduce existing objects. The artist often refers to his practice as ‘dark povera’, an intersection of Arte Povera’s material ethos with an African-American perspective. South Korean artists living under authoritarian rule in the Yushin era reacted to external societal pressures with investigations into material tension and restraint, as typified by the Dansaekhwa movement in painting. Landlord Colors will highlight this aesthetic tendency, as seen in Ha Chonghyun’s work and his material-reactive process of pressing paint to the surface of burlap-wrapped canvases from behind. In recent decades, many Cuban artists have tackled themes including the country’s extremely limited resources during The Special Period in the early 1990s, Cuba’s insular material culture that continues to operate outside the global marketplace, and the gradual introduction of new technologies. Cuban artist Reynier Leyva Novo will create a work for the exhibition titled S / T (immigrants), a five by five-meter rug made from the clothing of Cuban immigrants now living in the United States. The newly commissioned piece is part of a larger series of works by Novo, which draws inspiration from a specific type of welcome rug made from recycled and second-hand materials that is commonly found in Cuban homes. Finally, the exhibition will survey how contemporary Greek artists continue to negotiate their omnipresent history while living on the frontlines of 21st century economic and humanitarian crises. Landlord Colors will present works reflecting a range of influences from classical antiquity to virtuality, including a site-specific piece by Athens-based artist Zoë Paul. Paul’s practice often combines traditional craft techniques with discarded or found objects ranging from industrial waste to ancient utilitarian forms. She is invested in both the recent and historic lineages of these materials, and in their relationship to Greek civilization specifically. Greek sculptor Kostis Velonis will also create a new work for the exhibition, which will incorporate a discussion of materiality between Detroit and Athens. During the summer of 2019, a public activation series titled Material Detroit will expand upon the themes in the exhibition and connect art to vortexes of history and contemporary life across Detroit. Featuring artists, performers, and writers representing cross-section of generations and disciplines, the project expands like an energy grid across the city with site-specific performances, new commissions, and conversations anchored with community partners. This robust public art and performance series is a collaboration between three Detroit curators and institutions: Laura Mott, Senior Curator at Cranbrook Art Museum; Taylor Renee Aldridge, Founder of ARTS.BLACK; and Ryan Myers-Johnson, Director of Sidewalk Detroit. Landlord Colors: On Art, Economy, and Materiality is organized by Cranbrook Art Museum and curated by Laura Mott, Senior Curator of Contemporary Art and Design. Landlord Colors is the culmination of a three-years of research supported by a Curatorial Fellowship from the Andy Warhol Foundation of Visual Arts. The project is generously supported by The Andy Warhol Foundation for the Visual Arts, the Maxine and Stuart Frankel Foundation, the John S. and James L. Knight Foundation, and the National Endowment for the Arts.